Update: (See Update before this one, several paragraph’s down that was posted earlier Wednesday evening). This info came in late Wednesday night. Someone is finally talking. “His report, and I’ll go no further than this, is that he went to bed at 11:00 and she was watching TV,” Cornett said. “And he’s not seen her since?” THV’s Max Seigle asks. According to THV news, Cornett said police didn’t know she’d disappeared when her car was found; it wasn’t until Friday when she didn’t show up for work when the formal investigation began. He also said it takes time to get the dog teams in place. BUT, wait….Dawna’s car was found on Monday, so the police didn’t know she was missing when her car was found, but the investigation didn’t start till Friday when she showed up for work. 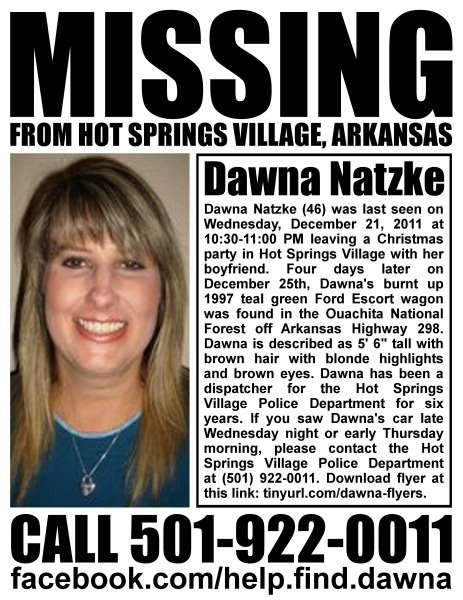 Update: I have heard today that the search has been called off, again for Dawna Natzke. What is going on? The family has been told not to talk to anyone, which I have heard over and over again from case to case. I do not know why the police tell the families not to talk. Sorry, but I would be talking to every news outlet that would have me if my loved one was missing. Sorry, police dept., I don’t think my letting the news know that my loved one is missing will interfere with your case. And the police is not talking, either, saying they are too busy to talk to the media. Locals are now looking for Dawna by themselves. A friend is bringing food to her teen kids, while they quietly wait for some news. Please family members, you need to get out there in front of a camera and talk, otherwise this case will get too old for the media to be interested anymore, and you will have lost your window of opportunity. Just think about past MP cases. The story went national because the family was out there tooting their horns and asking for help and doing candlelight vigils and searching with neighbors. I wrote the other day how a local Arkansas online paper posted that the police called off the search on Friday so their police officer’s could spend the holiday with the family. Then the search was back on Monday and Dawna’s car was found and then the DailyMail reports the search is back off again. Late Wednesday, I heard the dogs were back searching on Wednesday. Why were they not searching on Tuesday?